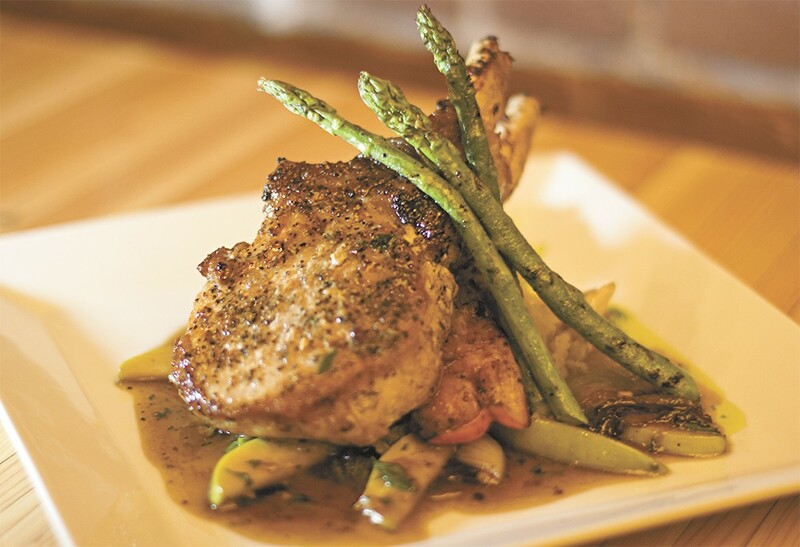 Tamarack Public House's double bone-in pork chop. Upon entering, your eyes are swept up the red brick walls to the 18-foot fir ceiling mirrored by glistening walnut floors. There's a staircase leading to a lofted dining room sprinkled with chic details like rope trim, old-world lighting and art glass framed with hardwood. But the Settlemier Building didn't always look like this. Built in 1891 by George W. Settlemier, the downtown building on Sprague Avenue first operated as a grocery store, with the Settlemier family living in a loft that once extended out as a full second floor. 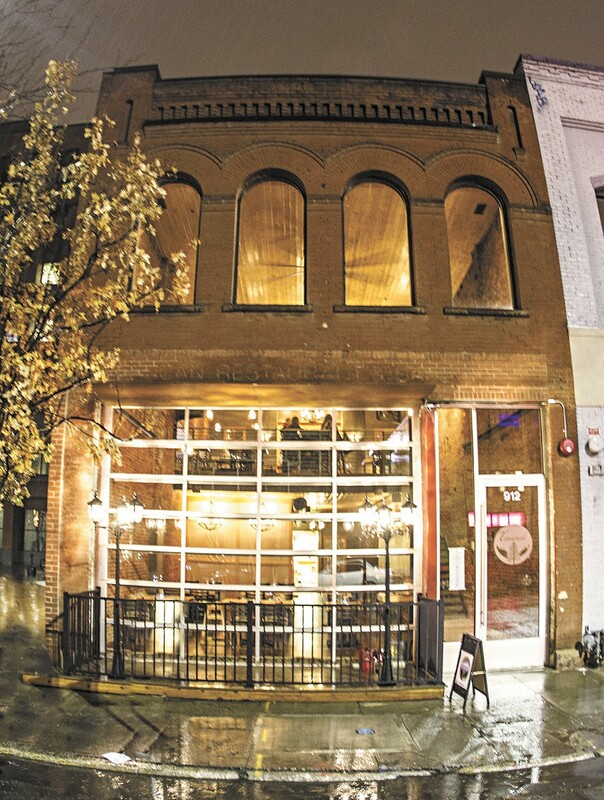 Over the years, the building changed hands and uses — furniture shop, saloon, bakery, restaurant, café, music store, hotel, tattoo parlor — but now, it's the home of Spokane's newest gastropub. Teresa and Leo Gonder acquired the building and began renovations about a year ago, leading to this month's opening of the Tamarack Public House. For the design of the building, the couple wanted to recreate some of the finishes it would have had in the late 1800s, so crumbling sections of walls were replaced with hand-troweled artisan plasters, and Leo designed and crafted true-to-the-period art glass doors and windows. The new look of the 118-year-old building. "From researching the history of it, it deserves to be brought back to some semblance of what it was," says Teresa, who's worked as a chef for years and recently managed a trio of restaurants at Stevens Pass Resort. Leo, an artist turned designer/general contractor, and his construction company, Gonder Custom Construction, did the work, including soda-blasting the brick, installing the tongue-and-groove fir ceiling, custom designing the two bars, constructing a kitchen and bringing the building up to code. When it came to upgrading the utility infrastructure, the Gonders got help from the city of Spokane. They were the first to benefit from an initiative approved by the city council in September that created a pilot utility installation project providing up to $40,000 to businesses to improve the water and sewer lines of older buildings in the city center. It's wonderful to see so many old buildings downtown that reflect Spokane's history, says Teresa, but businesses often don't have deep enough pockets to withstand the cost of renovation. "Even with being able to have Leo do so much of the work, it would not have penciled out for us to cover the cost of upgrading the city's utilities into the building," she says. "Tamarack would not have happened without the initiative." 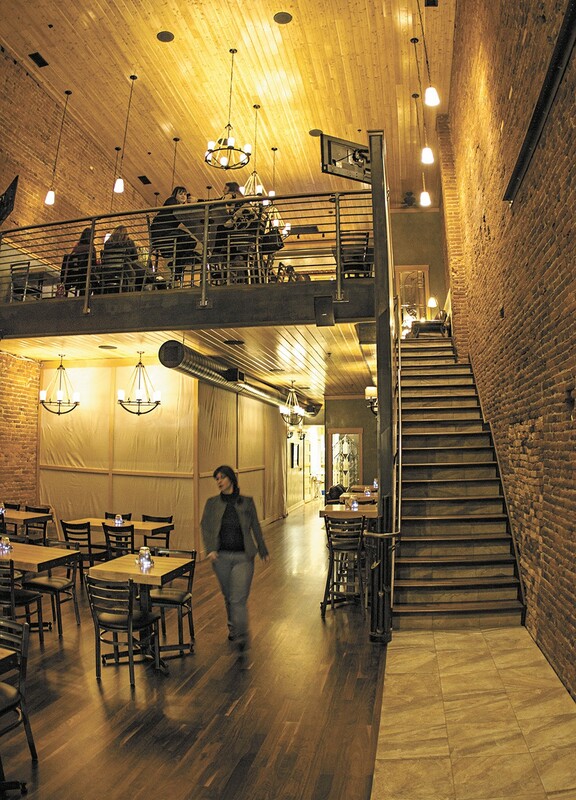 In the same way the Gonders used craftsmanship to reinvigorate the Settlemier Building, they chose to source their menu from craft breweries and distilleries and family-run operations. The loft bar is stocked entirely with craft liquors, labels like J.P. Trodden, Woodinville and Oola among them. And while the downstairs main bar (currently still under construction, but Teresa says they're aiming to have it open by their Feb. 14 grand opening event) is set to have a handful of more common spirits, the 24 beer taps and the other eight upstairs will shy away from big names and stick exclusively to craft brews, with a few handles reserved for kombucha from Bare Culture. Chef Danielle Briceno, who Teresa brought over from the Davenport Hotel, created the farm-to-table-focused menu, which lists roughly 17 items. "We're not going to have a huge menu," says Teresa. "We're going to keep it small so we can guarantee the quality that way." The meats from Angus Meats and breads from Alpine Bakery show up in dishes like the steak Bianca focaccia pizza, Tamarack Burger and Claw Hammer Pub Steak sandwich, designed around Claw Hammer Ale Washed Jack cheese from Cascade Cheese Co. in Leavenworth. Vegetable-heavy items, like the drunken kale salad with rainbow carrots and golden beets and raisins, feature ingredients from Charlie's Produce and, when in season, the farmers market. "The other cool thing about the menu is that it goes all the way from a good selection for the vegan all the way up to the carnivore," she says. Instead of designating certain dishes vegan or gluten-free, they're willing to make any item on the menu to those specifications when asked. Teresa says it's about offering a well-rounded experience, meaning it's not just about the environment, just the food or just the spirits, but the combination. And it's about letting other creative businesses share what they're passionate about. On First Fridays, Tamarack plans to host a brewer or distiller (12 String Brewing on Feb. 6) and there are plans to install courtyard seating on the west side of the building to share with Nodland Cellars and the public.